Experience designers are part of a much larger history of all kinds of designers spanning many mediums. My story in the design world began within a tight-knit graphic design school bubble and eventually landed me in the wild west of web design, where I’ve come to observe a few things. As I was making the (largely intimidating) switch from print design to experience design, I pushed away everything I knew about print in order to make room for new. I dismissed traditional design culture, assuming that the past had nothing to offer me. Reflecting on the first year of my career as a full-time experience designer, I realize that I’ve come back around to the design fundamentals I learned in school. Long ago, my interest started when I became yearbook editor in high school, leading to various internships and freelance side gigs, and ultimately to a B.F.A. in Graphic Design from Northeastern. The program provided me with a great foundational education, but it wasn’t very focused toward where I wanted to be—web and product design. As I was graduating, Northeastern rolled out lots of fancy new majors—Experience Design, Data Visualization, and Interaction Design, to name a few. When I started college, I was simply interested in Design as a whole. I knew I wanted to be a designer. I didn’t think about print vs. digital, or any kind of specialization. I saw no difference due to my inexperience. Even the web industry hadn’t matured to the point where design roles became granular, like “interaction designer” or “user interface designer”. UX wasn’t a trending topic on Medium, and job listings still asked for simply “web designers”. When I started college, I was simply interested in Design as a whole. I knew I wanted to be a designer. I didn’t think about print vs. digital, or any kind of specialization. I feel fortunate to have gone to school during such a transformative time (or at least that’s what I tell myself when I see those awesome new majors). I approach my work with the perspective of the old and the new, both traditional graphic design fundamentals and newer experience design strategies. Back at Northeastern, some friends and I started a student-led design studio called Scout. We worked by those traditional design fundamentals everyday. That was honestly the only way we knew how to approach our work, even when we were teaching ourselves new UX methods everyday. We all trained together in the same educational system, and fiercely held each other to high standards and best practices. We spent hours endlessly critiquing each other and pushing ourselves to produce great work. On top of that, we were under the umbrella of the school, so we had the flexibility to only accept open-minded clients with projects we believed in. In today’s current experience design industry, I often forget that the basis for many of my design decisions is rooted deep within that background and training. From the invention of glyphs and writing, to the Arts and Crafts movement, to the Bauhaus school, design has an incredibly rich and multi-faceted history. Since UX has become a common term and practice area, many people I encounter in the industry come from career-driven programs like General Assembly or are self-taught via the Internet, avoiding print design altogether. Honestly, I’m glad that design education in the tech space has become more accessible. In fact, I may have taken the same route myself if I had known about one of those programs. Even so, I constantly find myself drawing on my lifelong interest in design and my traditional training when I’m trying to solve design challenges. Over the past few years, I’ve encountered brilliant designers who execute beautiful work. Sometimes, their design solutions are inspired by a trend found online, or by one blog post by a well-known designer. Though executed stunningly, they don’t always take a measured and thoughtful approach to problem solving. Standard design fundamentals and theory taught me that it’s important to focus on empathy, strategy, attention to detail, and many other aspects of a thoughtful and purposeful design. Though I look to Dribbble and Pinterest just like most modern designers seeking inspiration, I always have to remind myself to stick to many of the design principles and practices learned during my education. If you’ve ever been through a harsh, nitpicky, and slightly soul crushing design critique, you know that thoughtful design requires great attention to detail. Though strategy and experience design beg for someone with the ability to step back and see the big picture, details can make or break an experience. Through the years, graphic designers have adhered to and expanded upon detailed guidelines and principles when it comes to typography, grid systems, color theory, and more. For example, working with type is a decision that involves form (x-height, ascenders, descenders, weight), counterform (kerning, leading, tracking), point size, line length, placement, alignment, hierarchy (I could go on). All of these things, developed and created by countless designers throughout history, still apply today in user interface design. Unfortunately, kerning between two specific characters on the web doesn’t always make sense with the CSS letter-spacing property. One must give up a certain amount of control for the web. Finding a balance between the nitty gritty details and a functional, accessible web design is difficult, but crucial. 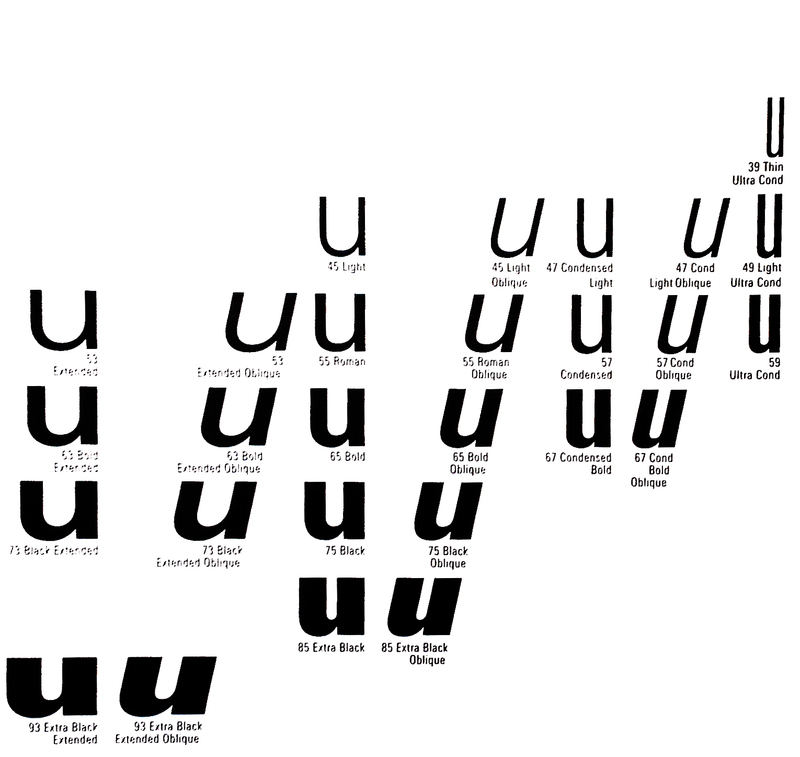 Source: http://showinfo.rietveldacademie.nl/univers/images/univers%2021%20weights.jpg Adrian Frutiger designed 21 gorgeous fonts for the Univers typeface family, meticulously crafting each weight and style. All designers love a solid typeface with a large font family, but that means nothing on the web if you don’t include specific weight font files in the CSS (automatically-generated bold is not a great look for ANY typeface). It often seems as if human-centered design principles were only realized in the last decade or two within the realm of experience design. I’ve recently realized that graphic designers (the good ones) have been designing with the audience in mind for a long time. Early in my design career, I learned to keep my audience in mind when it came to readability, accessibility, and organization, as well as message, emotional impact, and meaning. Some early projects from classes that come to mind include redesigning the McDonald’s menu with a focus toward different audiences (gluten-free, health nuts, etc.) and designing an Olympics schedule to help fictional attendees plan which events to attend using the time, location, and sport. When I found myself shifting toward user experience design three years ago, I found the “human-centered” approach to be a natural transition. Our team’s user research methods could certainly be applied to a design project of any medium. “Design is directed toward human beings. To design is to solve human problems by identifying them and executing the best solution.” –Ivan Chermayeff of Chermayeff & Geismar & Haviv, a branding and graphic design firm that designed the now classic logos for NBC, National Geographic, and more. 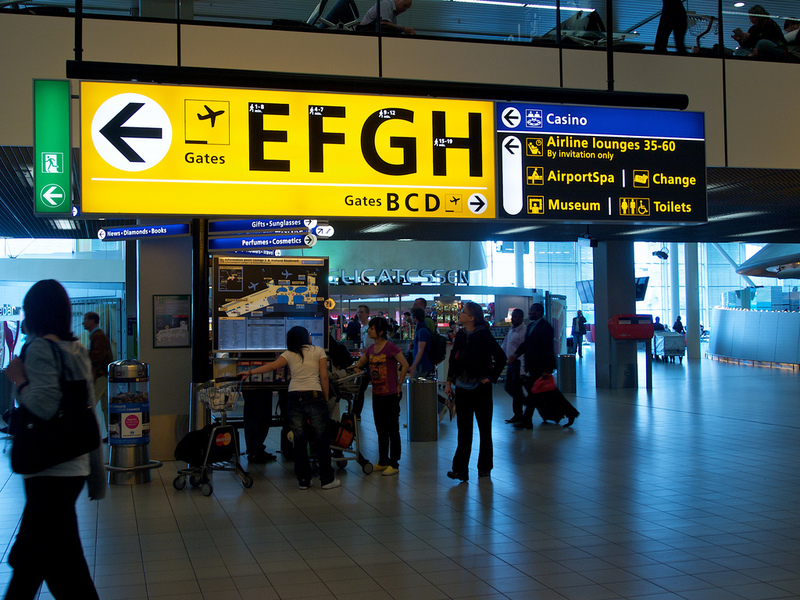 Amsterdam Schipol Airport wayfinding system by Benno Wissing. Though it’s an international hub and hosts thousands of people each day, travelers are able to easily and painlessly make connections due to the excellent navigational system. At Fresh, experience designers and strategists spend a lot of time devoted to discovery, users, the industry, business goals/constraints, team alignment, and content needs in order to search for the “why”. The “why” is the reason this product, service, or business exists, or needs to. In my early design years, I worked on several branding projects for small student start-ups on campus and initiatives at work. As my work progressed and I improved my design skills, I realized that the heart and soul of branding wasn’t in the logo, the colors, and the typography (the “kit of parts”), but in the voice, brand attributes, and the message behind it. In branding projects, before moving into concrete design, I asked the same questions we ask during the strategy phase: What problem is this product trying to solve? Who is the audience? What will motivate them? Strategy and discovery also come into play in wayfinding, data visualization, marketing campaigns, furniture design, and so much more—it’s only natural that digital experience designers would adopt the same practice. It’s not surprising that businesses and organizations are truly beginning to understand the value of design thinkers in business strategy—designers have been strategizing for decades, so we know what we’re talking about. In this age of connectivity, I’m fortunate enough to have access to countless resources, tools, methods, and perspectives to help solve complex design challenges. Though I no longer spend my days designing logos or brochures as I did in school and previous jobs, I won’t forget the timeless design principles of days past. As young as the digital design industry is, we are all standing on the shoulders of design giants. The evolution of design has a long and detailed history. As we carry the torch forward and keep innovating on top of timeless principles, design will have an even greater future. If you want to learn more, here are a few excellent resources that go into depth on some of the design fundamentals that I consider key, as well as the history of design.